Another good year for the roses? 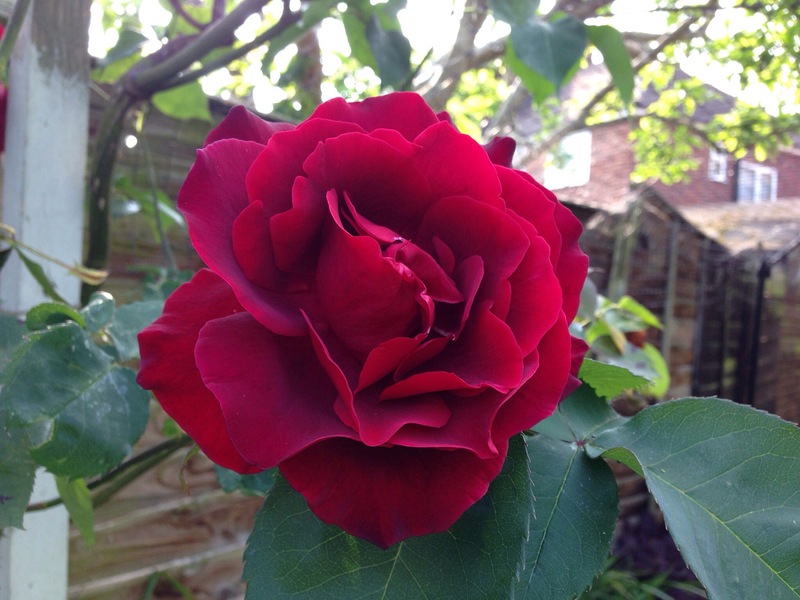 I am sitting out in the garden surrounded by roses, a somewhat calming experience after all the tension surrounding the EU Referendum, and rewarding given the stormy weather of the past week. This year seems to be an exceptionally good year for them. If I turn to Facebook, several of my friends have been posting photographs of stunning roses from their own gardens. In fact one friend caused a great cross-purposes conversation by posting dozens of photos of ‘Graham’ and ‘Gertrude’ which caused J to remark that she was even posting photos of other people’s roses now until I gently pointed out that she was referring to her roses ‘Graham Thomas’, a lovely deep yellow/gold, and ‘Gertrude Jekyll’, a dense cabbage shaped pink! Without doubt June is the month for roses and both of my gardening magazines arrived sporting photographs of beautiful blooms on the covers this month – in June roses sell! The trouble with magazines arriving featuring roses is that you are always tempted to acquire some more! I used to think that I wasn’t a rose person but I think I now need to put my hand up and admit that this is no longer the case. 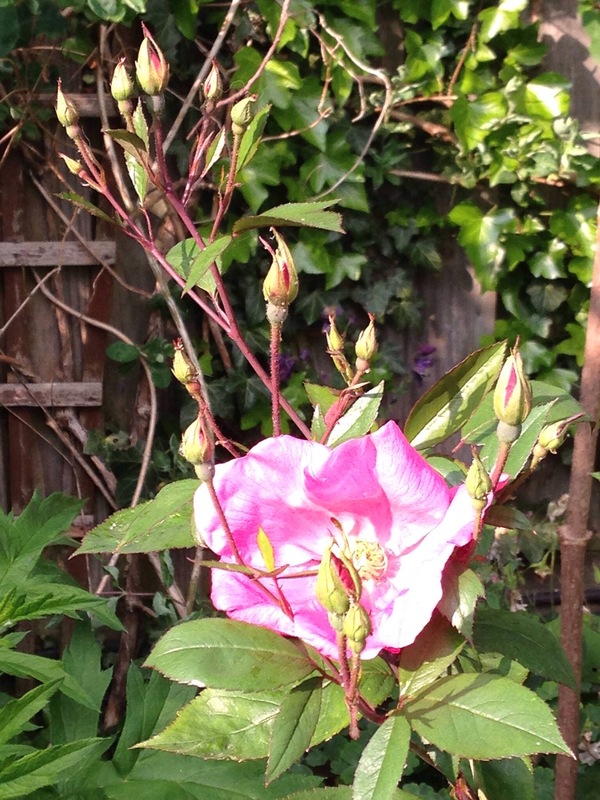 This morning I started by taking photographs of two of my roses that are just starting to come into bloom. 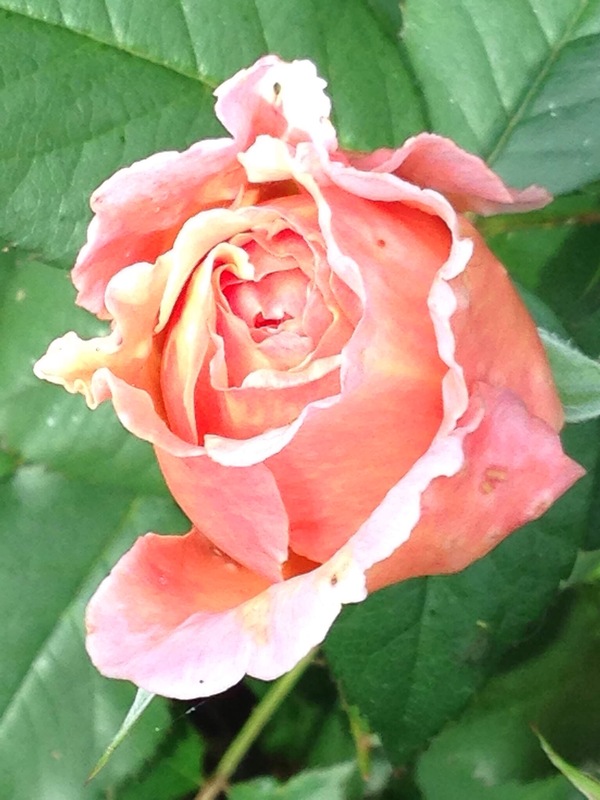 My Shropshire Lad (above), a David Austin rose, had the most perfect pinky / peach bloom opening and adjacent to it the Rosa Mutabilis (below) had the perfect set – tight buds, slightly open buds plus a full bloom, all displaying closely together. Of all our roses I think it’s fair to say that Rosa Mutabilis is the hard worker, the one that starts flowering in May and will still be performing its socks off come September. The flowers are single, so attract bees, and are relatively small. They start each day crisp and peachy and then gradually they darken into a deep cerise. On the opposite side of our garden we have had a huge surprise this spring. The red climbing rose (Etoile de Hollande) that we despaired of, has sprung into action and produced the most blooms in its life! We first planted it to grow up the pergola some 15 years’ ago but it was reluctant to either grow or flower. Each year we had two or three flowers that were so dark in colour that they just disappeared into the green background. No amount of careful pruning, feeding or training could seem to coax it to produce the sort of display we had in mind. Whilst the blooms were stunningly scented as promised, we had to be quick to catch a whiff of them, being sure to cross the wet grass at just the right moment. After seven or eight years of this we gave up! 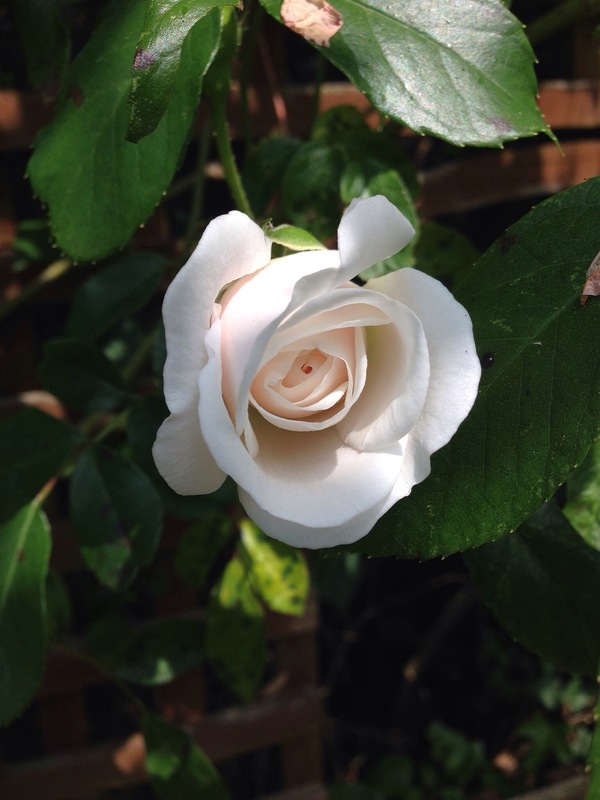 We bought a white climber (Iceberg) that was known to be more prolific and which would show up better at a distance. Out came Etoile and it was somewhat unceremoniously planted on the opposite side of the garden, near the greenhouse, and in an area that we don’t really know what to do with as it is very overshadowed by next door’s huge Magnolia. However, last year our neighbour decided that said Magnolia really was getting far too big for its boots and so the tree surgeons were employed to do some radical but careful pruning. Presumably as a result of having more light and air, the rose has leapt into action! It has been flowering for a couple of weeks already and, as I look across now, I can see at least a dozen flowers open. Being next to the greenhouse, it is much nearer the house and easier to take a sniff at its magnificent scent each time we pass. I am hoping that, now it has finally found its feet, this is the start of something new and we’ll have many fragrant Springs to come. Fortunately, after all that swapping around, I’m pleased to say that the Iceberg climber has grown well and is set to be a stunner this summer. The first buds are just beginning to unfurl but the plant is covered in them. In terms of shape, this rose is doing just what we hoped for and has grown up one column of the pergola and then along the top so that you can sit beneath an arch of rose. The only snag is that the rose now appears to be pushing the pergola over and everything has a distinct lean! In the autumn / winter we will be faced with the challenge of replacing the pergola but without disturbing the plants too much. The other rose I wanted to comment on is both the biggest and the smallest. It’s a tiny white flowered wild rose that forms a long bank beneath our cherry tree and was here when we arrived. I have to credit J with giving this a great deal of TLC which means that it is now a shapely bank of green dotted with little white stars that really bring light to an otherwise dark area of the garden. Rather strangely, just as it flowers it also throws out long branches of new growth which can sometimes hide the flowers. Each year we remove these but we have wondered whether these would flower in the autumn? I guess that there’s only one way to find out! Roses consistently top the polls in voting for the nation’s favourite flower which led me to wonder whether any of you have a favourite flower that you would like to share here? Or perhaps even a favourite rose? Categories: Blog post | Tags: Roses | Permalink.